Sick of remodeling ideas that are only possible for the rich? The 101 home remodeling ideas in this list will help you make your home more comfortable, valuable, and functional. Most important of all, they are affordable, and almost all of them can be done without hiring an expensive contractor. While not all these projects may be appropriate for your home, you should be able to find at least 5 to 10 to do over the next couple of months in your free time. Even if they’re small projects, they will quickly add up and help you transform your home. And yes, this is a long article. Do as I did while creating it, grab a hot cup of coffee (see which single serve coffee makers I like), kick back and enjoy this list. What kid (or man) doesn’t want a race car bed? Many bedroom remodeling ideas seem like cool projects until you realize that you’ve spent a ton of money on an impractical set-up that you’ll hate in a few years. The ideas we’ve chosen are relatively affordable and practical projects that you’ll enjoy for years to come. This brilliant makeover can be done in a weekend and can brighten up any bedroom with those old ugly bi-fold doors. Starting with some cheap hollow core doors, add on some measured wooden panels to create your base. A coat or two of paint and some sharp (but inexpensive) hinges are all that is needed to finish off this project. The materials should cost approximately $100. It’s a shame when beautiful decor is ruined by a hideous popcorn ceiling. 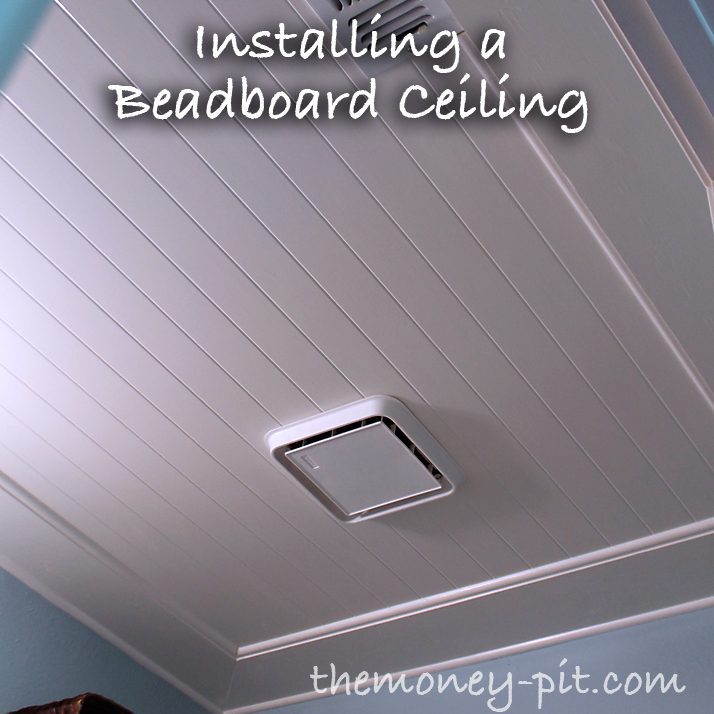 One elegant solution is to install a beadboard ceiling. The project appears deceptively simple. You’ll need to get beadboard from any local hardware store (easy), but then you need to measure it out correctly and cut it so that it fits your ceiling. While this is fairly easy for the experience DIY-er, it can be tricky lining things up right. Remember, measure twice, cut once. Bead board is relatively cheap, but you still don’t want to be ruining slabs by making the wrong cuts. Once you notice how much your room resembles a simple box, you’ll want to do something about it. 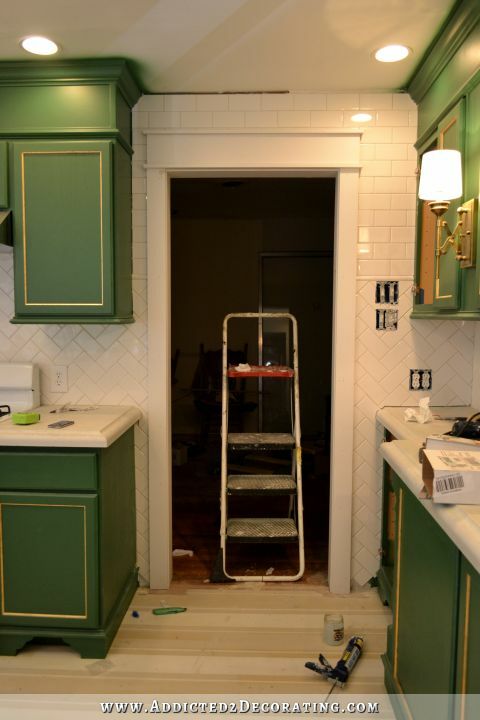 One popular option is to add crown molding. Crown molding refers to the trimming that can be added to connect the walls with the ceiling. If you pick the right one for your room, you’ll add a nice touch of class. You can get crown molding either online or at a local hardware store. Depending on the style you’re looking at, it should cost you around $100-300, and a few hours of your time on a few weekends. The only tool you’ll need is a mitre box and saw (to cut those corners perfectly). Minimalist design is not only beautiful when done right, but also clears up a ton of room in smaller spaces. 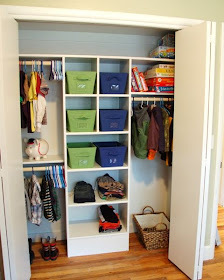 Pick up a cheap shelving unit from a local store (or find a used one on Craigslist) that’s appropriate for your closet. Give it a coat of paint if needed. You can add rods for hangers, hooks, and attractive baskets for storing random objects. These are all inexpensive additions that will make your closet more functional and more attractive. 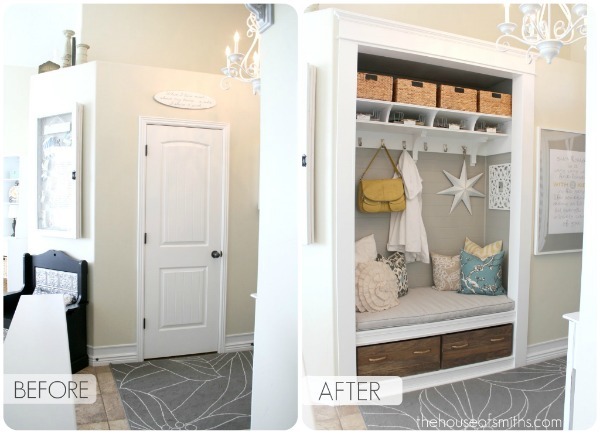 Additionally, here’s another 11 ways to hack your closet space. The difference a sleek headboard can make on the appearance and comfort of your bed cannot be understated. If you’re handy and have some spare time, you can put together a beautiful headboard for under $100. Drum shades are all the rage right now, but often come with a hefty price tag. If you don’t mind heading to the craft and hardware store, you can pick up the supplies to make a beautiful shade that won’t hurt your wallet. Before you start, make sure that there’s a part of your lighting fixture that you can hook it on to. This type of drum shade will not fit all fixtures. Also, if you are concerned about flammability, use a fire-proof spray on your shade. Extra storage is always important in a small kid’s room. With all their toys, you need somewhere to put them that isn’t the ground. 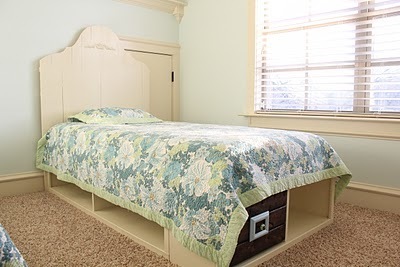 The next time you’re thinking of upgrading a bed in your home, consider building your own bed, complete with tons of conveniently sized compartments for storage. While it will take a significant amount of time, it will be incredibly rewarding and can be done on a budget. What inviting bed doesn’t have throw pillows to top it off? While they aren’t too expensive to buy, they can add up quickly. If you’re interested in improving your sewing skills, you can create unique low-cost throw pillows that add some personality to your bedding. Don’t limit yourself to just one option though, here are a bunch more, and here is another detailed guide on how to make them (sewing instructions included). Make sure to plan ahead if you aren’t an experienced craftsman, as it will take a significant amount of time and patience to build. On the plus side, you’ll have a beautiful, functional bed and a huge sense of accomplishment when you’re done. The wood for the project shouldn’t cost you more than a few hundred dollars, maximum. You’ll need a circular saw and a good drill for this project, along with other common small equipment like safety glasses and a measuring tape. This genius shelf can store books and other objects in a bedroom. Instead of a boring shelf, you essentially get a piece of functional artwork. You can buy it here on Amazon for about $170, which isn’t exactly cheap, but not just for millionaires either. Note that if you don’t already have construction tools, it’s probably cheaper to buy it pre-made. 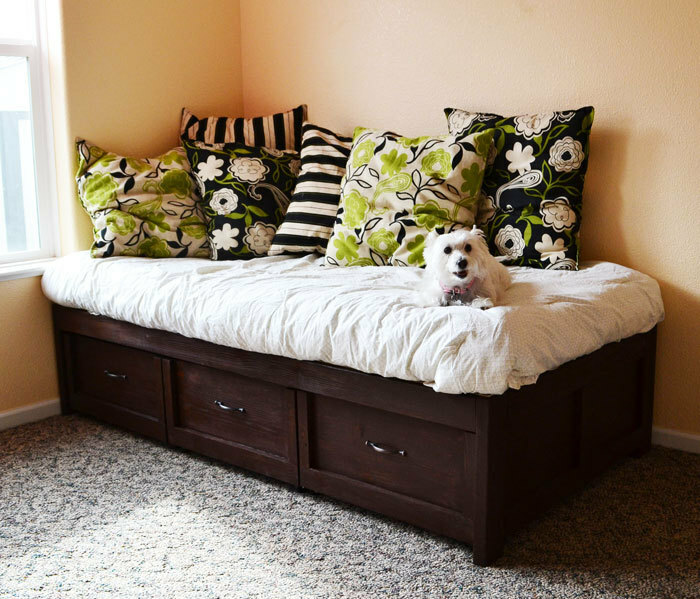 Benches are not only useful, but they can really improve the look of your room. If you build your own, starting from a cheap (possibly used) bench, you can make a gorgeous bench for $40 or less. Don’t feel that you need to build your own, there are plenty of great options online and in stores that won’t cost more than $200. This is one of the coolest remodeling ideas there is. If you want to feel like James Bond once in a while, a secret room in your home is a must. Unfortunately, most secret rooms are incredibly expensive to build, which puts them off-limits for normal people. The solution: a Murphy door. 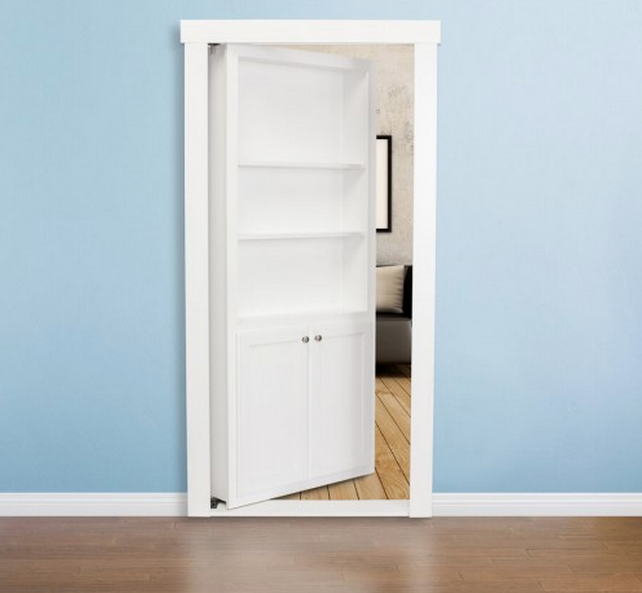 While a Murphy door isn’t cheap, it’ll run you around $1500, it is by far the most affordable way to create a secret room. 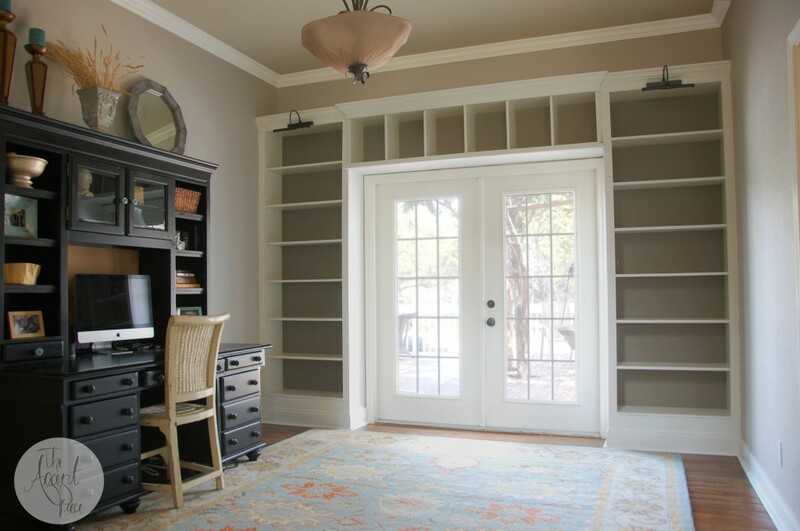 The bookshelf slips into your doorframe, perfect if you have a walk-in closet in your master bedroom. 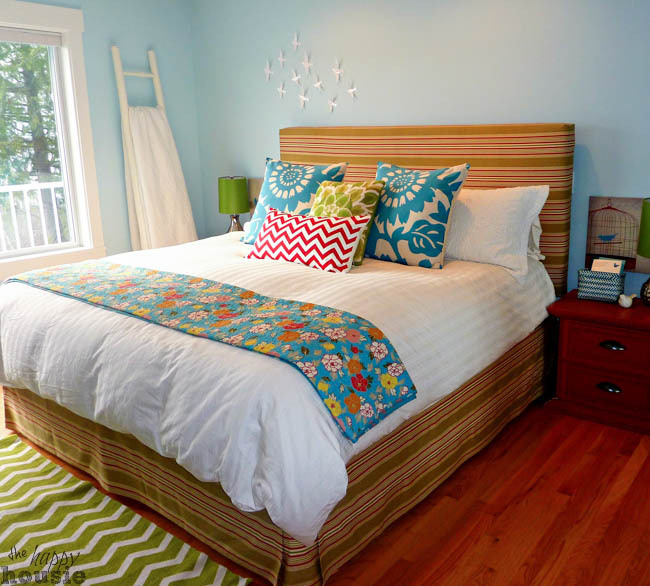 Before you start any of these projects, consider the color scheme of your room. Having a great color scheme can make even a boring room look great, while a poor color scheme can make an amazing room look out of sorts. Once you have your colors, you can start your projects. When it comes to paint, do it well. Here’s an excellent guide to help you paint like a professional. 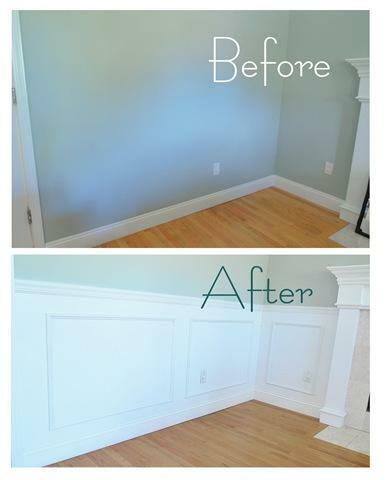 Don’t limit yourself just to walls, you can paint dressers as well to make them look like new. 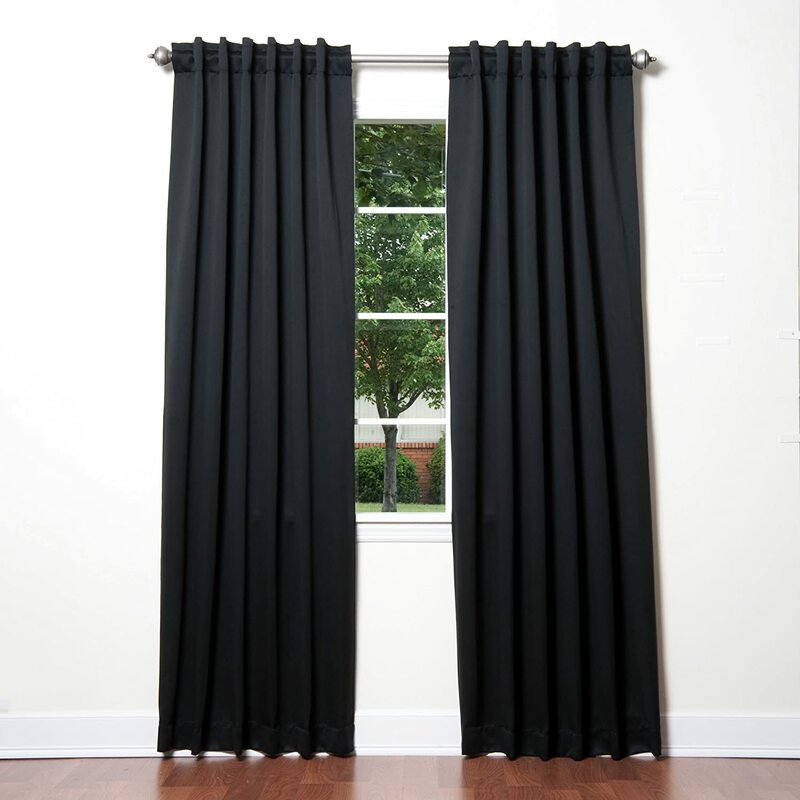 Blackout curtains are incredibly stylish, and go with almost any room. On top of looking great, they block out nearly all sunlight, which increases your quality of sleep. Additionally, when closed during the day, they can block out sunlight, keeping your air conditioning bills lower during the summer. Best of all, they’re relatively cheap. You can get a great set of blackout curtains online for under $50. Note: Blackout curtains come in all colors. Not only is it fun to look at yourself, but the light that mirrors reflect can make your bedroom seem larger and more open than it really is. The most effective way to do this is to place a large mirror (or a few medium sized ones) on a wall that faces the windows. The mirror doesn’t have to face it perfectly, as long as a decent amount of sunlight will hit it. Murphy beds are great space-savers in small rooms, especially for kids. Flipping them up on the wall during the day frees up a lot of space for activities. The problem is that most murphy beds are expensive, which is usually a problem if you live in a small home. Luckily, with a little work over a weekend or two, you can make your own. 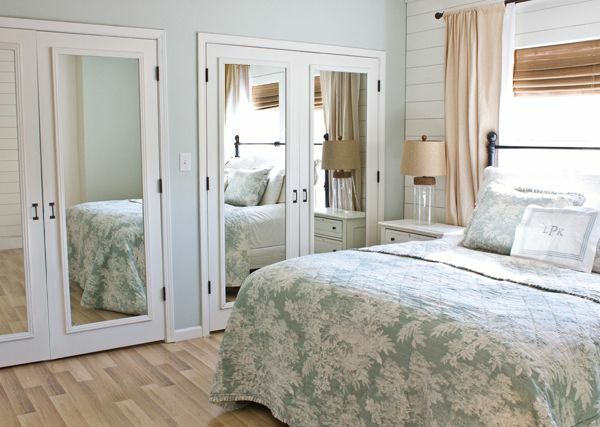 Mirrors in the bedroom are a great way to open up the room and make the best use of natural light. Additionally, having full-length mirrors on your closet is practical while getting dressed. Instead of buying new expensive doors, you can convert your old ones by adding a sheet of mirror (about $40 per door), and some trim around it. Bathroom upgrades can make a huge difference, but are typically difficult to do yourself. Some of these remodeling ideas may require you to save up for a while. We’ve tried to include a few ideas that you can do yourself on a budget. If you’re aiming for elegance, cabinet handles can make a big difference. Upgrade from the standard plain handles, there are hundreds of options. 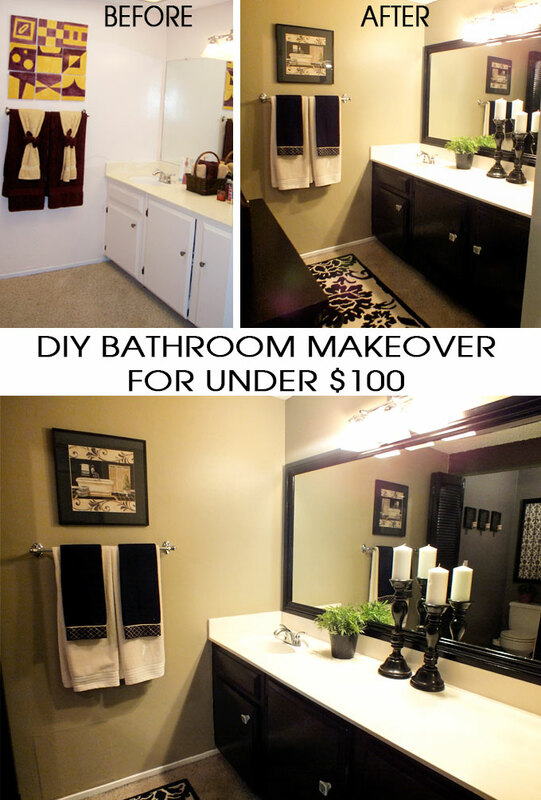 Not only is this cheaper than replacing your entire vanity, but it will take less than an hour to do. We’ve all seen the bathroom with the ugly fuzzy purple mat and the bright pink towels. The thing is, a nice set of towels and a good looking carpet won’t cost more than $30-50, and will make a huge difference. Sometimes the small things matter as much as the big ones. If you’re looking for a cottage-like feel in your bathroom, this DIY project might be the perfect weekend job. You’ll need to measure the space on your wall you’d like to cover, then head to a hardware store. Start with some slabs of wood (they don’t have to be pretty), and then some simple pipes, flanges and caps. The real character of the shelves come out when you stain the wood, which is a relatively cheap and painless process. See the detailed steps here. Toilet paper is of course essential to every bathroom, but that doesn’t mean it needs to be lying about. 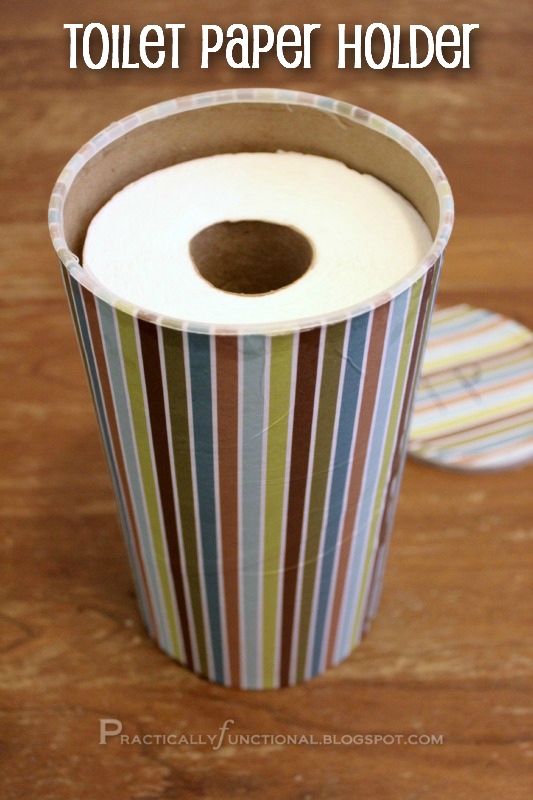 This creative little toilet paper holder is made of an empty oatmeal canister and some decorative paper. It can be made for under $10 and in under 10 minutes. You can see a bit more detail here. This project, while seemingly difficult, is actually very simple and quick. the classic appearance. You’ll likely need 1 box, which is about $50 – not bad at all. It’s a good idea to have a hacksaw, but other than that, all you need are the stones, which can be found at Lowes, and some construction adhesive. While it’s very simple, you can see more detailed pictures and explanations here. How much do you think the floor in the above picture cost? In reality, only $50 and a few hours of time. If you have that ugly old laminate flooring (you know what I’m talking about), it’s time to replace it. Once you dig up your old, nasty laminate, all you need to do is put down peel and stick down the vinyl tile. 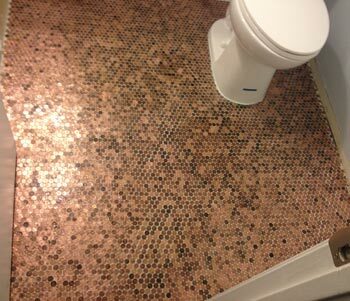 If you’re really looking for a unique idea, consider lining your floor with pennies. Be warned, it is going to take a long time, and a lot of pennies. The cost works out to about $2 per square foot, which isn’t too expensive for small bathrooms. If you plan ahead and are particularly artistic, you could even stain, clean, or paint the pennies before hand to create a design. You’ve probably tried many types of cleaning solutions involving baking soda and vinegar, but none have really worked. 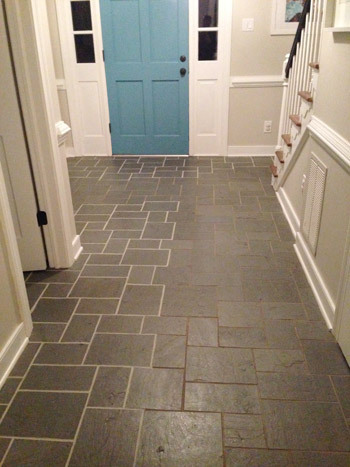 The best product by far costs about $10 from Home Depot, and it’s called grout renew. A simple and cost effective way to upgrade your standard clip-in mirror is to frame it yourself. The process essentially boils down to cutting cheap wood trim to fit your mirror, staining or painting it, and then simply sticking it on your mirror with adhesive. 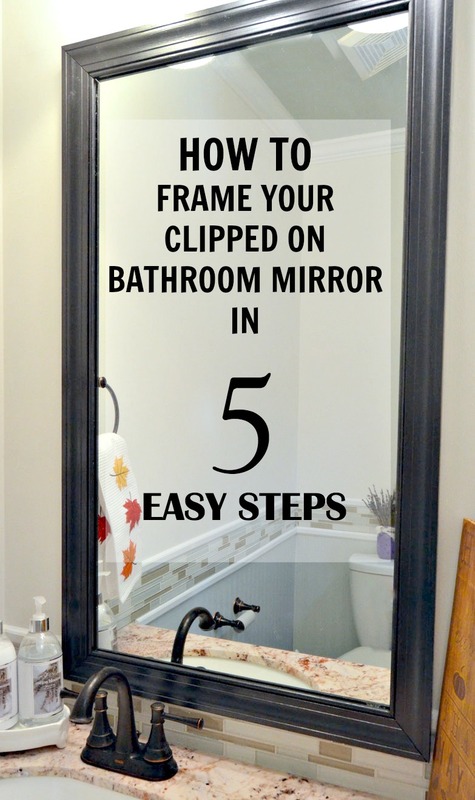 It’s a simple process, but it makes a huge difference in the attractiveness of your mirror. Applying a new coat of paint can be really effective when done right. If you’re making other changes to your bathroom, it’s a great chance to change the whole color scheme, which includes your cabinets. 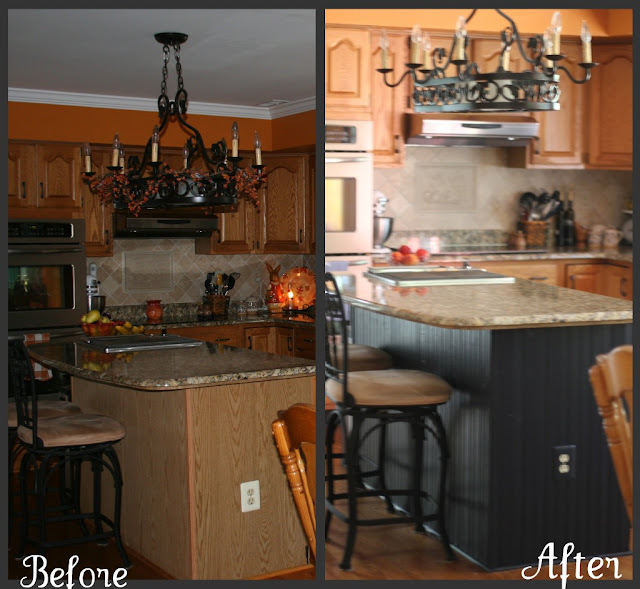 One popular choice is to choose a dark, earthy color to make the room feel more elegant than the standard cheap wood color that most cabinets are made of. Not all bathtubs are created equally. If you enjoy soaking often, making an investment in a deep tub with back and arm support can make a big difference. 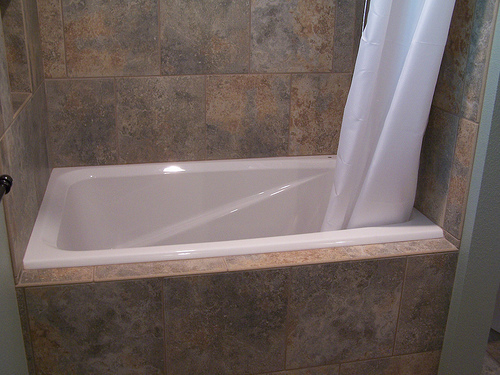 Most standard deep tubs are around $500, so the total cost will depend on whether you can do the work by yourself. Did you know you can buy bathtubs online? All the smaller bathroom remodeling ideas can do a lot for your room, but if you want a big change from a single idea, it’s going to need to be bigger. 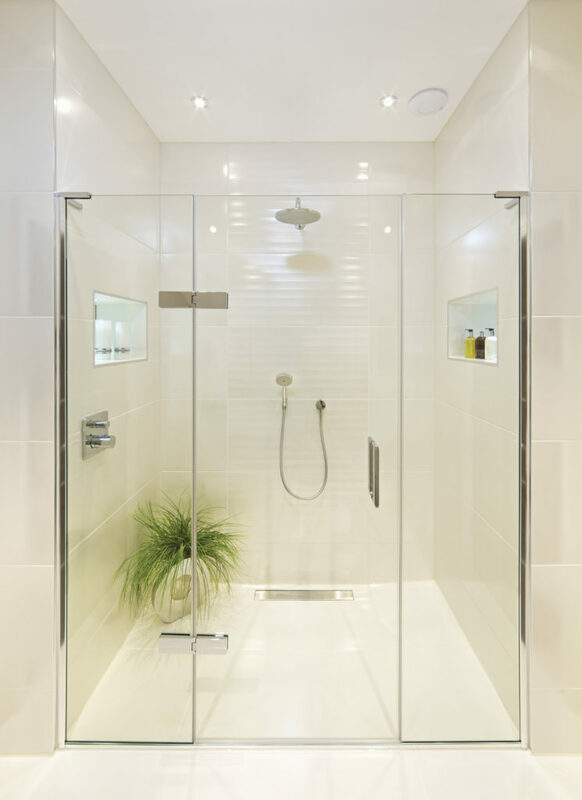 Putting in a new shower is a big job, but can make a huge difference. can be done for as little as $50. You can go with a small backsplash, as in the picture above, or cover your entire wall behind your sink and mirror, if you have a smaller area. 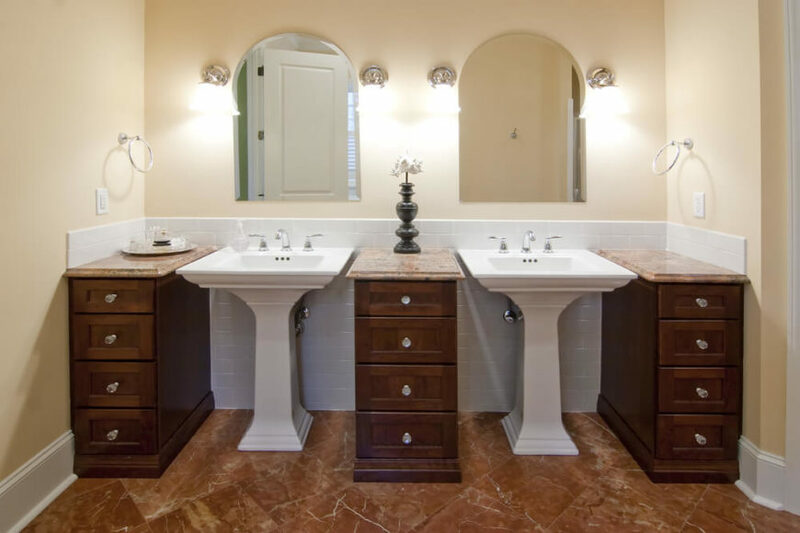 Mirrors have obvious use in the bathroom, especially a full-length one. In addition, this can also help make a small bathroom seem larger. 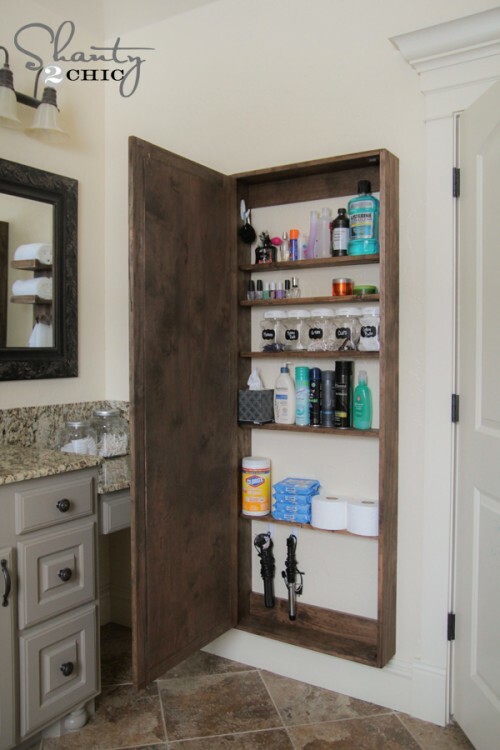 This custom DIY mirror can also store a heck of a lot of stuff laying around, cleaning up the appearance of your bathroom. The best thing about this project is that it can be done for less than $100, but make a huge difference to the room. If you leave your mouthwash bottle on the countertop, like most people do, you’ve probably noticed it’s not the prettiest bottle in the world. A great option is to fill up an olive oil bottle instead. You can order a beautiful olive oil dispenser online for about $10. Add in some cheap paper cups and any elegant tray and you’ve successfully classed up your bathroom in just a few minutes. 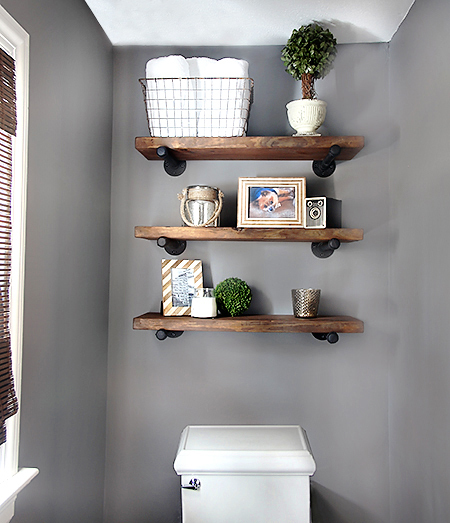 If you’re interested in crafting a unique bathroom, consider ditching your traditional shelving in favor of a ladder shelf. While it takes up more room, it also keeps towels and other important accessories in an easy-to-reach spot. You can find a pre-made ladder shelf for under $50. Apply a coat of paint if necessary so that it goes with your bathroom’s color scheme. (relatively), but a lot cheaper. A plank wall is perfect if you’re aiming to give your bathroom a cottage or beach feel. You’ll need to cut up the plywood sheets, apply some sort of finish to them, and then just nail them up. If you could buy a concrete vanity countertop for $40, wouldn’t you do it? Thanks to the magic of Ardex-Feather Finish, you can make your vanity look exactly like concrete. Essentially what you’re doing with this weekend DIY project is applying a very thin layer of concrete, and then adding the finish on top to create a great look. Your kitchen should be beautiful, but also functional. Many of these kitchen remodeling ideas will help you accomplish both on a tight budget. A cabinet under the sink quickly becomes nonfunctional once you put more than a couple things in it. 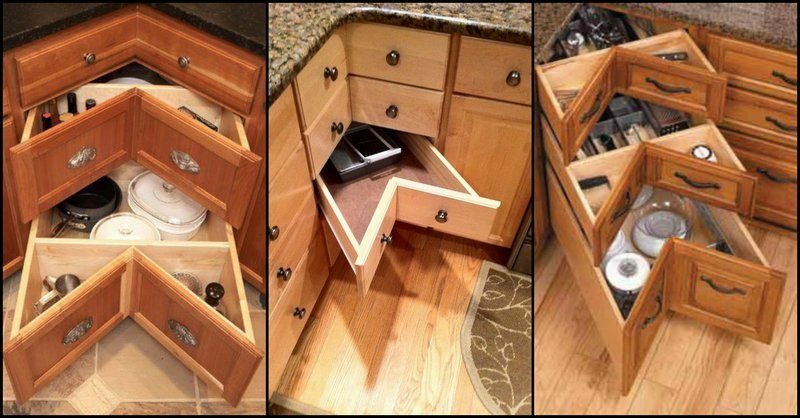 Drawers, on the other hand, make it easy to find and reach anything under the sink. This is a fairly unique design, which will require custom woodwork in most cases. If you are handy, you may be able to do it yourself. Most will need to hire a contractor for this remodel project, expect it to cost between $500-2000 depending on your contractor and the type of material used. This countertop project costs an unbelievable amount. Can you believe that it only cost $56 to make the countertop in the above picture? By using just simple wooden planks, and then staining them in an attractive manner, you can make a gorgeous dark countertop for under $100. Granite countertops are beautiful, but not exactly in most homeowner’s budgets. While you’re never going to get the true appearance and performance of the real thing, granite paint comes a close second. For an $80 can of granite paint, you can give your counters a very close look to real granite. It is really important to read and follow all the instructions exactly as written, or you could end up with a counter that is easy to chip. Everyone has that ridiculously thin or short cabinet by the oven with way too many pans, which makes getting anything out inconceivably difficult. By using simple dividers or building custom plywood shelves, many cabinets can be transformed into easy-to-access, and most importantly functional storage. Not all remodeling projects require you to call a contractor and buy new expensive appliances or fixtures. Most kitchens can be improved a significant amount just by applying a new coat of paint. 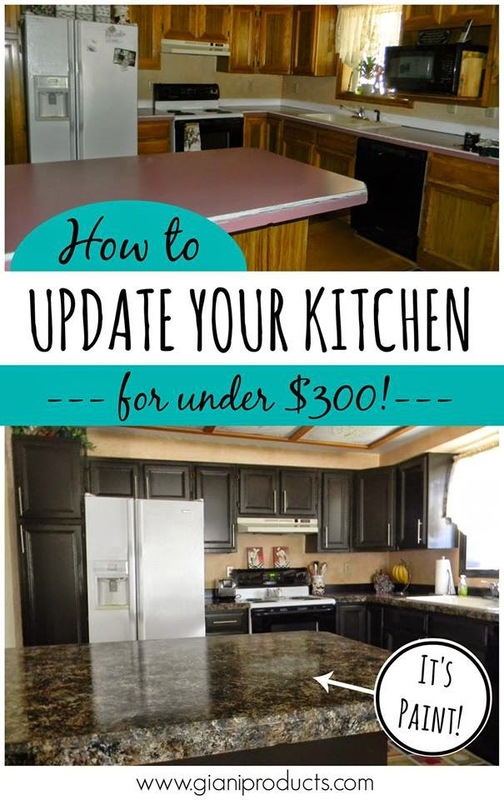 For less than $100 you can have cabinets that look like new. Look at most designer kitchens and pay special attention to the style of faucet. You will notice that most of them have a simple gooseneck faucet, which is the name for a faucet with a thin curved water outlet. Gooseneck faucets are not only more elegant, but they are also more functional than standard faucets. 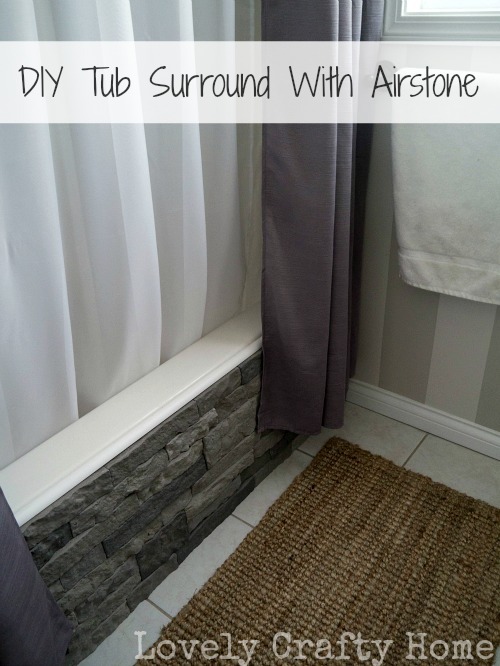 This small remodel idea is very easy to do yourself and doesn’t cost much. 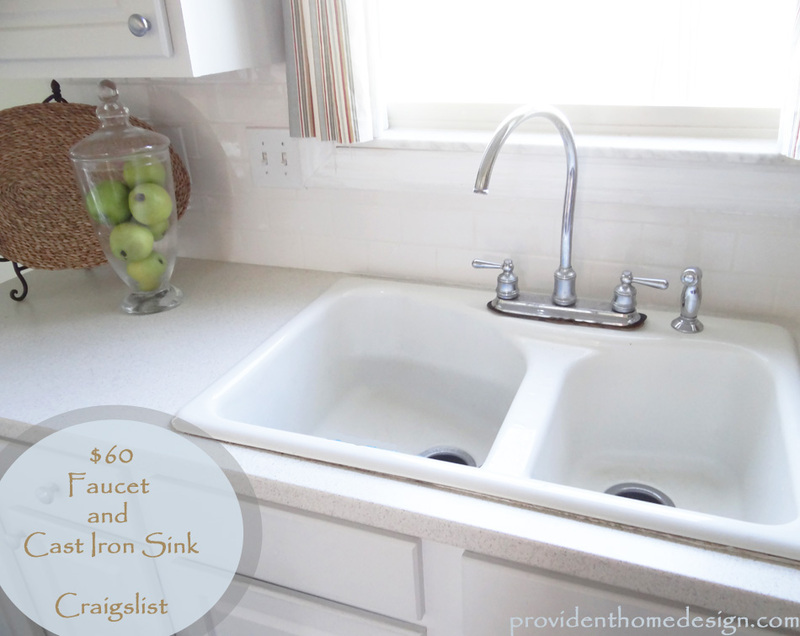 You can get a beautiful gooseneck kitchen faucet for around $60 online or at a local store. Putting just a few plants can really spruce up your kitchen.You could even think about planting herbs in teacups, which is also practical. The type of plants that you choose will depend on the look you are going for, as well as where the plants are located. Some plants are better in low-light spots than others, and some plants will need more water and care than others. Here’s a fairly thorough guide for plant ideas for the kitchen. Glass cabinets are a great way to open up your kitchen, and they also have the added bonus of making it easier to find dishes (especially for guests). If you feel like you don’t have nice enough dishes to put on display, consider putting in only a few glass cabinet. If you’re experienced with DIY projects, you shouldn’t have too much trouble with this remodeling project. It involves cutting out the inner part of the cabinet and replacing it with plexiglass. If you currently have a worn paint backsplash and are looking for something to add a little creativity to the room, consider a custom backsplash project. Most backsplashes can be made for $20-50, and some, like a pegboard, can be very functional as well. When you think of artwork for the home, the kitchen isn’t the first room you think of. That being said, a few tasteful pieces can add a lot to the look of the room. Or you could even paint your own. 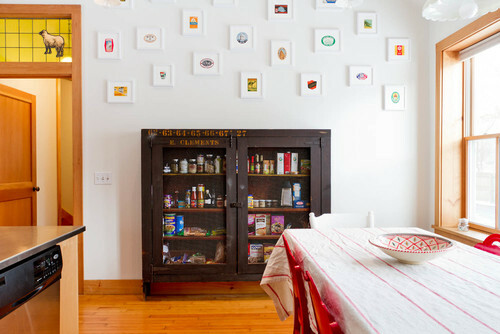 If you’re not the most artistically inclined, read through this guide to choosing kitchen artwork. Most of the best remodeling ideas for the kitchen are about improving functionality just as much as appearance. The cabinets in most kitchens tend to make organizing dishes and cookware difficult, and often results in poor usage of deep space. 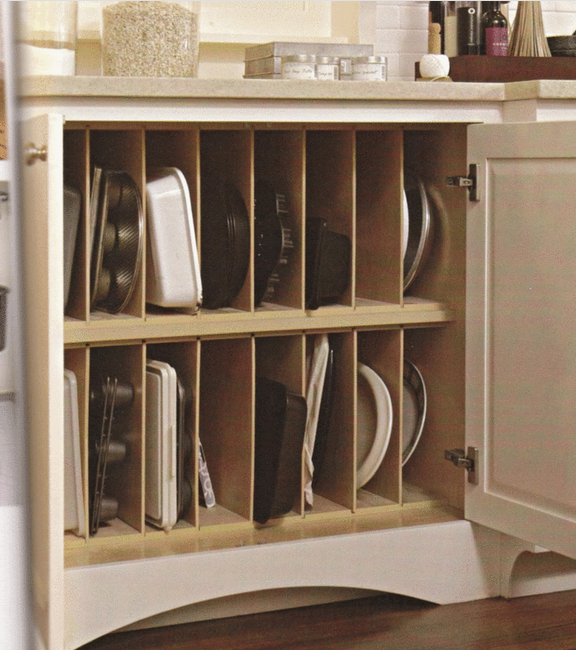 Pull-out shelves are an elegant and function solution to standard cabinet problems. They can be installed in an afternoon and only cost $50-100. Warning, these shelves look simpler to install than they really are. If it’s your first time doing so, I recommend taking a look at these full instructions for installing this type of shelving. A whiteboard in the kitchen is extremely useful to make shopping lists and leave message on. Unfortunately, they are also fairly unsightly, often making your kitchen look like a children’s schoolroom. If you want to kill two birds with one stone, you can not only add some life to your kitchen with artwork, but also hide your whiteboard by covering it with a picture frame. While you could attach hinges by yourself, you can also buy an already-assembled whiteboard and picture frame for $60-120 online, depending on the size. A painted beadboard exterior can immediately make a cheap kitchen island look 100 percent better. The best part is that beadboard is cheap, making this a much cheaper project than buying a brand new island. As far as tools go, you will need a Nail gun and preferably a basic mitre saw. 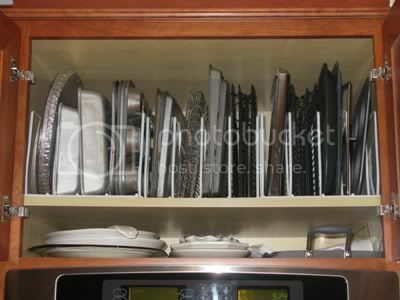 Another problem with kitchen cabinet storage are the ones that meet at a corner. They waste a large amount of valuable space. However, this is a project that is best left to a professional for most homeowners. Consider this remodeling option the next time you replace the rest of your cabinets. 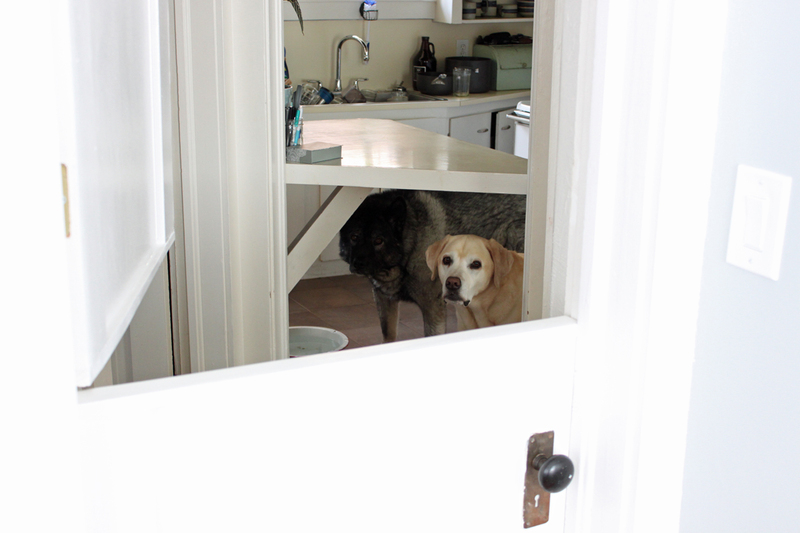 Most homes have an open “door” leading into the kitchen (often more than one). Adding a casing to these doors can have a huge impact on the appearance of the room, and can be done in a weekend on your own. There’s an easy way and a hard way to do this. If you’re looking for a DIY option, stick to using pre-made under-cabinet lights, like this one that costs $16. You’ll likely only need 3 or 4 at most. The lights come with an attachment so you can easily hook them up in series, then you just need to plug in one of them to an outlet. Other than the lights, the cost of this project is minimum, you’ll just need some ties or hooks to hold the lights and wires in place. 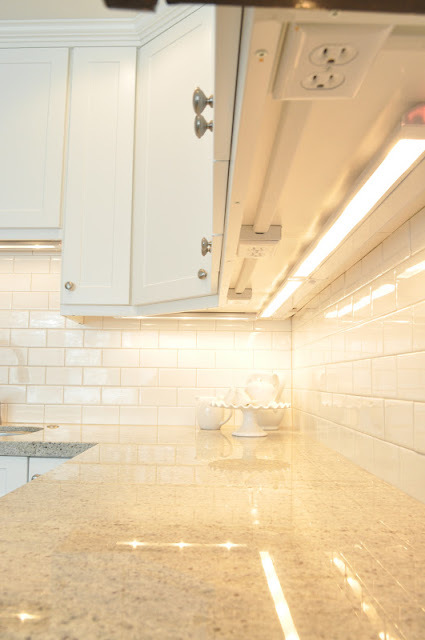 Here’s another inexpensive remodeling idea for your kitchen lighting. You can either buy a drum cover, or make your own following these instructions. Drum lights are great at focusing lights on important areas if you have high ceilings, and despite the low price, they look great. Are you stuck with 20 year old, faded brass handles? 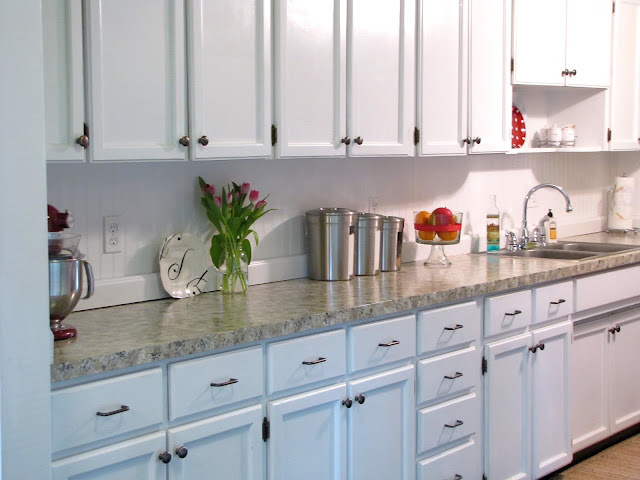 If you’re still using the handles your house was originally built with, chances are putting in modern handles would not only be more functional, but would modernize your whole kitchen. You can get a bulk set online for under $100. This set of 25 from Amazon is just $60. While this is a popular option for the kitchen, you could also use pull out cabinets/units under desks in offices, bedrooms, or the garage. The cost of this is really up to you. You can buy fairly high quality cabinets on Amazon for about $100. Alternatively, you can also make your own table with drawers and add wheels to it. 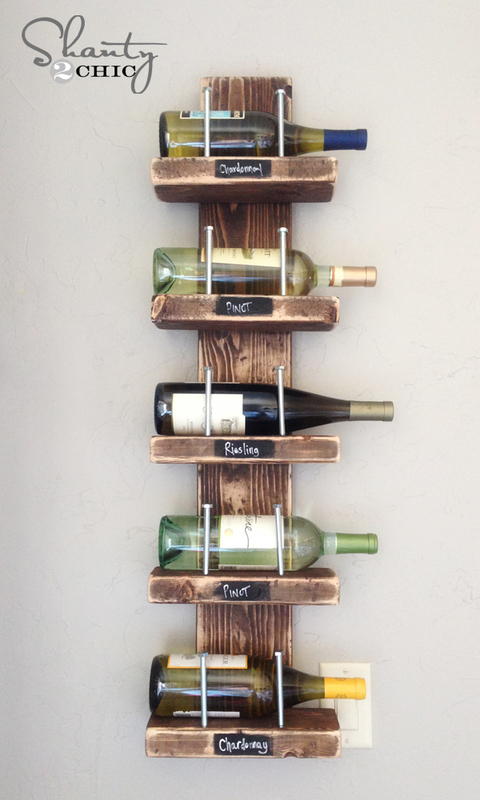 This is a simple and space-efficient wine rack project that’s great for any kitchen with empty space on a wall. Like many other remodeling projects, applying a quality wood finish to some cheap wood cuts, creates a final product that looks far better than what the cost would suggest. All you’ll need is a 2×4, a 2×6, a wood finish, and hex bolts to hold the bottles in place. Other materials are fairly common and there’s a good chance you already have some, like wood glue. Accessing kitchen outlets conveniently is a common issue. Unless you have experience with electrical work, this project should be done by a professional. By mounting outlets underneath cabinets, you have easy access to outlets as needed. It’s a fairly small project when building or remodeling a kitchen, so it shouldn’t cost too much. the look of beautiful ceramic tiles. While other types of flooring can run up to several dollars a square foot, you can find a nice set of vinyl tiles for about $2/square foot. Here’s a brief overview of the process, but if you decide to go ahead with this flooring project, spend some time watching Youtube tutorials. Gallery shelves are about as efficient as it gets. 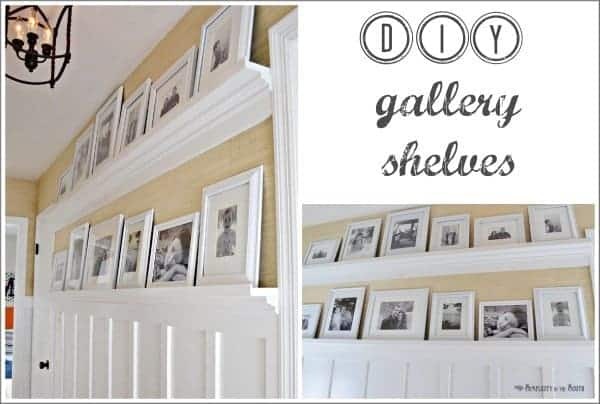 You can typically fit around 5 framed photos per shelf, which only occupies a few inches of space from the wall. Done right, it can add a great touch to your kitchen. Low on shelf space? This weekend project will cost you a shade over $100, but is well worth the minimal cost. This is a genius way to elegantly and conveniently store spices and other cooking supplies without filling the whole inside of a cabinet. 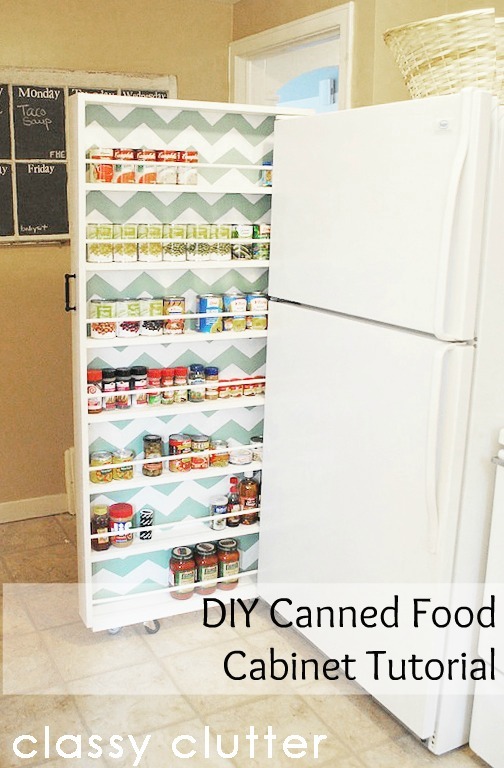 By building a simple frame on the side of a cabinet and adding shelves and thin rails, you can have storage for anywhere from 30 to 80 spice containers. This project will cost less than $50 to complete. Note that your shelving doesn’t necessarily need to be put on a cabinet as large as the one in the above photo. 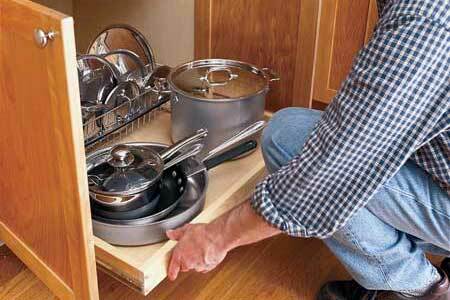 Even a cabinet half the size would provide enough storage for most cooks. Appliances are expensive, so you really have to pick your battles. The most important appliances are those that take up the most space and are used the most often – the stove and fridge. While it’s nice to get a new microwave, dishwasher and any smaller appliance like a coffee maker, they should be at the bottom of your list for a budget remodel. 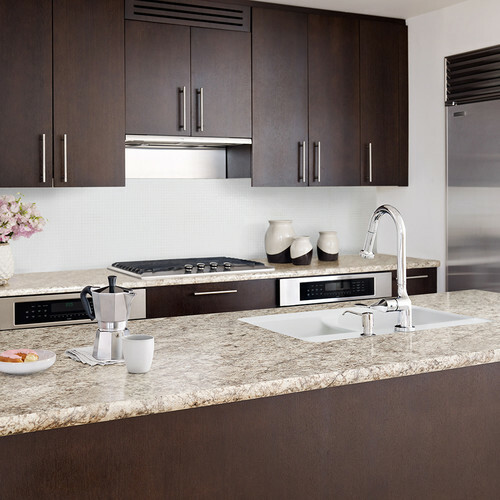 Stainless steel appliances have a timeless, classy look. If you already have stainless steel appliances but they are just a little worn, consider using liquid stainless steel paint to touch them up. It’ll cost you between $100-200. You can use stainless steel paint on plastic covers, but you’ll need to prime them correctly. All in all, you can get a decent set of the two main stainless steel appliances for about $2000. See 35 more budget kitchen remodeling ideas here. If you’re doing a major basement remodel, you should bring in a contractor unless you have experience. Moisture can be a big problem when augmenting the walls, and cement floors can be difficult to construct upon. The remodeling ideas in this section will focus on improving existing walls and furnishings in an already remodeled basement, as well as useful projects to improving a standard open-space basement. Many homes have ugly carpeted stairs leading to the basement, especially older ones. Underneath this carpet is usually some cheap/rough wood, that can be transformed with a little work. A standard unfurnished or partially furnished basement has an exposed ceiling that consists of wooden slats running across. This project simply involves spray painting those wooden slats. This project, that costs no more than a few hundred dollars (or much cheaper depending on the paint), looks amazing and maintains your ceiling height where other remodel ideas would not. If you have a concrete floor, this is a great way to dramatically improve the appearance of your floors, to an almost marble-like look. Other than standard painting supplies, all you’ll need is some concrete stain (about $50 a bottle) and you’ll be ready to go. Pay special attention to any safety guidelines on the product. To do this project yourself, first check out this guide to determine if your floor is a candidate for acid staining. After, see the step-by-step instructions for the project. Concrete isn’t ideal for every basement, and if you want to avoid carpet, your best budget option is typically vinyl plank flooring. Not only is it really easy to install, it’s very affordable, and holds up better than real hardwood when it comes to water. 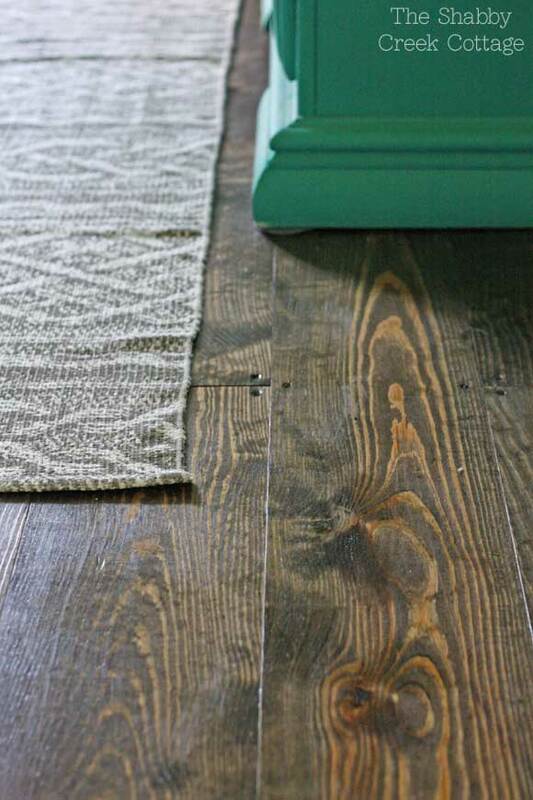 Here’s an example of a vinyl plank flooring that’s about $1 per square foot. There are many fantastic designs these days for about the same price at any hardware or home store. No, not an actual barn door. 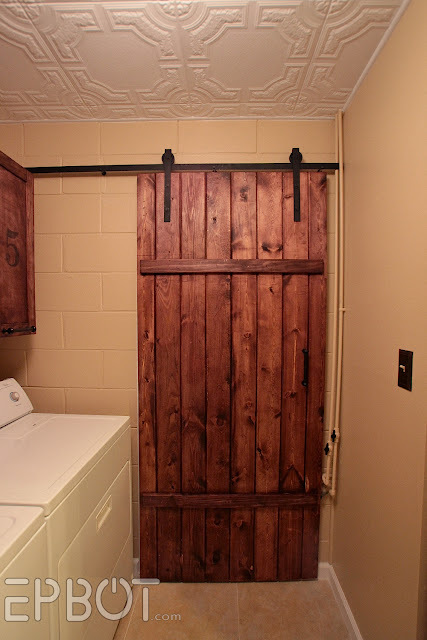 This project is another DIY job, costing about $100 and a weekend of your time to make a door that resembles a farm door. 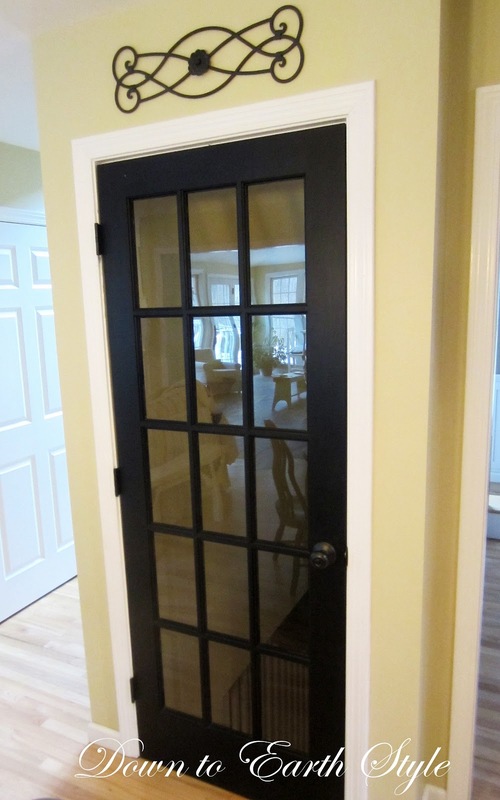 This slidable door is beautiful and a great way to add character to any room, whether it’s in your basement or not. It consists of about $40 worth of wood, a pair of sturdy wheels, and some metal rails so that it’s slidable. You can stain or paint it whatever color you like, but dark browns are the most popular. While it will take some elbow grease, this is a fairly simple construction project that looks great. Too many basements feel like you’re walking into a dungeon. A simple french door can add some class and an inviting presence to your basement entrance. Match the color of the door to the rest of your main floor color scheme and you’re set. This is a simple project as far as construction goes, although you may have to replace the existing hinges and paint the frame. A new standard french door typically costs $100-200. If your basement is partially furnished, it’s most like a nice open space. Once you start putting in more furniture, a nice half wall can divide areas up nicely, without totally closing up the area. They obviously require less material than a full wall and are much simpler to build, needing just standard carpentry tools. 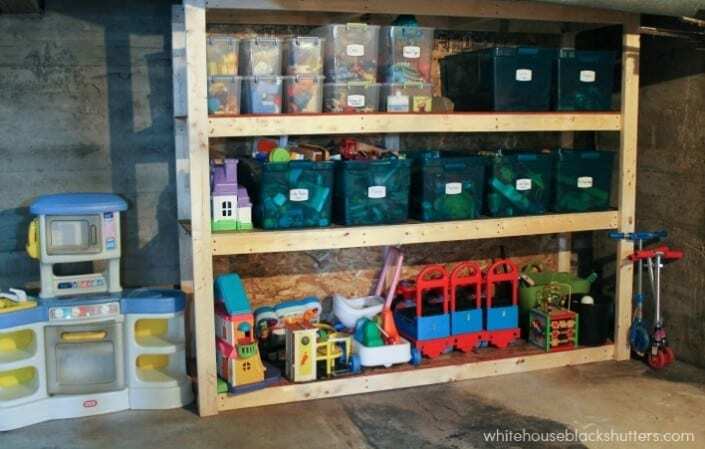 This project can be done for a little over $60, and is extremely space-effective for storing mountains of children’s toys. This is a great beginner’s construction project, as it is pretty difficult to make a huge error. You simply need to do a bit of size planning beforehand, and then cut and nail the slats of wood together. If you’re planning on using this in a finished basement, I would highly recommend staining the shelf to make it look more elegant. Most basements have at least a single metal pole for functional reasons, but there’s no reason it can’t look nice as well. and can be installed in under 30 minutes. You can buy the option circular table attachments for about another $60. The other option is to build your own pole cover out of wood, which is a good option if you are a handy carpenter or are going for a custom look to match the rest of your basement. For this option, you will have to make a box around the pole, and then add crown moulding or other trimming to finish off the aesthetic. 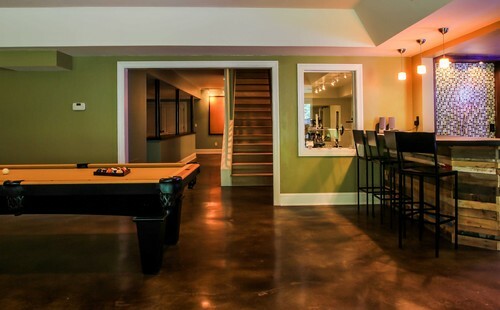 Basement bars can be extremely costly, but you can do it on a budget if you’re a bit creative. The example bar above was made primarily of basic stained doors. The bar itself will only cost you $100-200 to build and finish. Then it’s up to you how you want to stock it. You might also want to build shelving behind the unit on the wall. 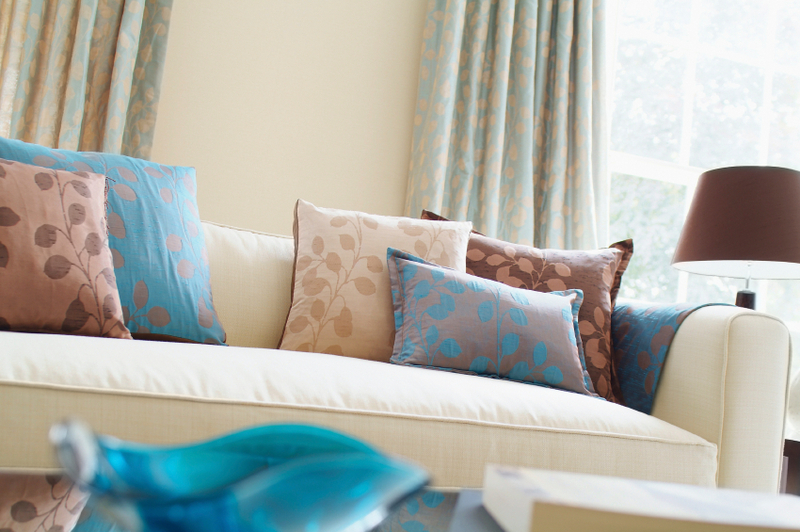 A lot of time is typically spent in the lounging areas of your home, so you better make sure they’re easy on the eyes. While these projects are bigger in general, they also have a larger effect. 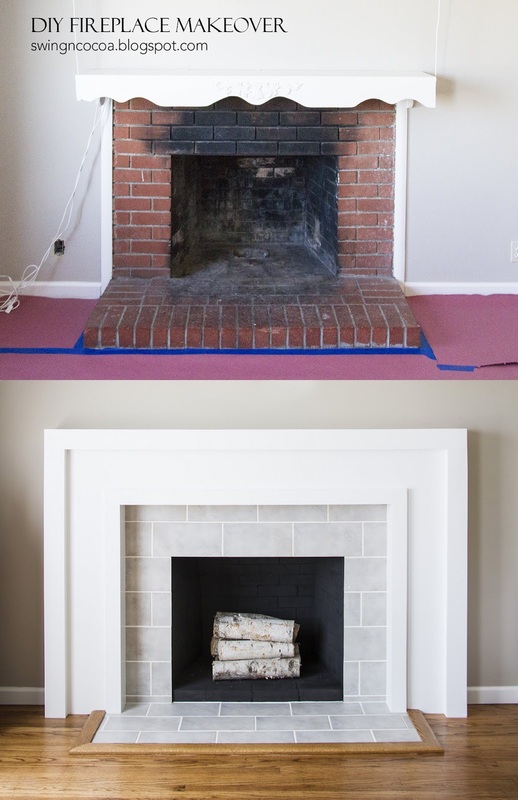 Fireplaces can add a lot of character and charm to your family room when done right, but if you have an old eyesore of a fireplace, it’s time to give it a budget makeover. Remodeling your fireplace may involve stripping down any ugly rock or brick, which will require a sledgehammer and a few hours of your time. From there it’s simply a matter of adding any covering of your choice (e.g. tile), painting, and adding framing. Finally, here are 25 other great fireplace remodel ideas. If you have a large exposed wall, and short trimming along the bottom, adding panels can add a great texture and look to a room. You can find thin panels at a hardware store (the above panels were from Lowes) for $12-15 apiece. The project should take about 20 hours and cost around $250. A big misconception is that DIY projects must be done from scratch to save money. Sometimes you can still keep your costs down, even if you buy a few ready-made components. 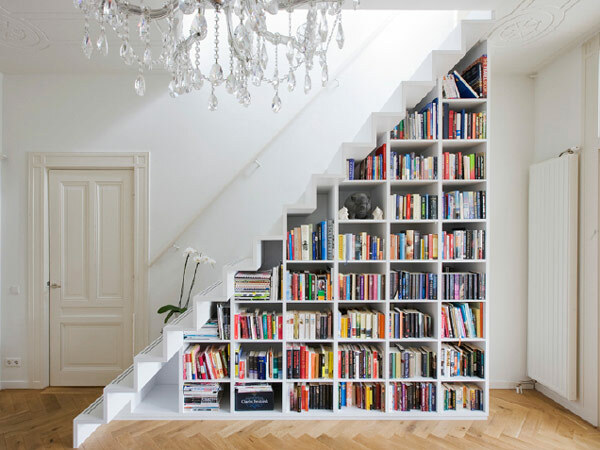 The shelving unit pictured above uses Ikea’s Billy Bookcases. By using these units as the base and adding tasteful framing and trimming, the end product looks a lot more expensive and attractive than the approximate $400 price tag on this remodel project. 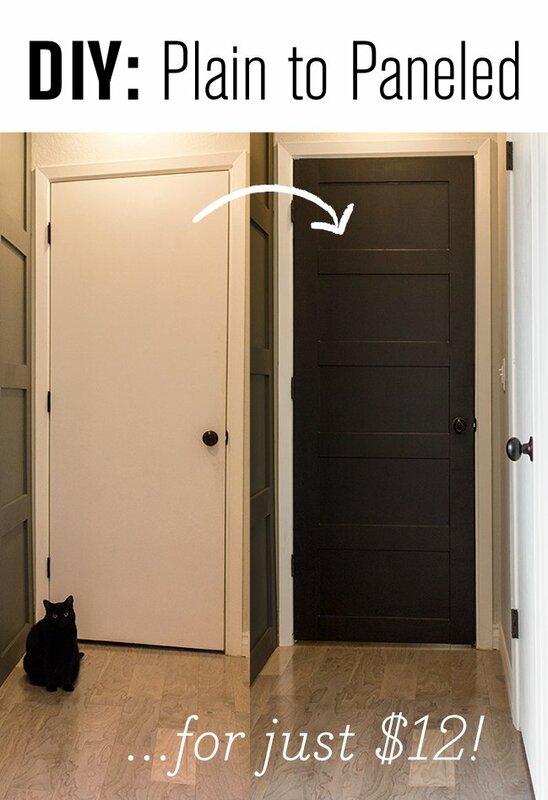 This small, simple, and low-budget project can transform your plain, cheap-looking doors into big, beautiful, expensive looking openings. If you have carpet, you can likely pull that up and get right to work. This project is very simple, although it will take a while to complete. There are two key components of this flooring: the wood and the staining. Pick high quality pine planks that are about 4 feet long, and find a high quality wood finish stain, like Minwax. Once you’ve polished all your main rooms, it’s time to focus on the connecting areas of your house for a total home remodel. These projects can be done for multiple areas of your home, so keep an open mind and let the ideas flow. Plain doors just look cheap, but panelled doors can easily add some sophistication and warmth to your home when done right. 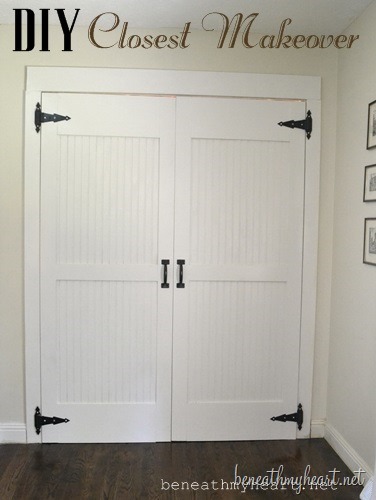 If you have wooden doors already, this project is easy and inexpensive to do. It won’t cost you more than $50 and 5-10 hours of time, depending on your construction proficiency. You’ll need to buy and cut the wood into vertical and horizontal planks that fit your door, and then nail them on (with a hammer or nail gun). 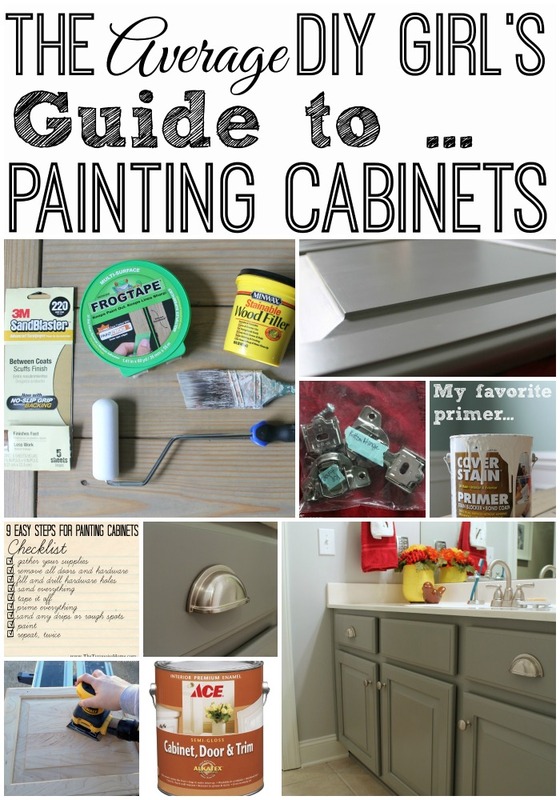 Finally, you can stain or paint the door to really complete the look. A nice dutch door can go for $1000, which isn’t practical for the average homeowner. These doors can be very useful if you have small children or pets that you would like to keep an eye on while you are in a different room. 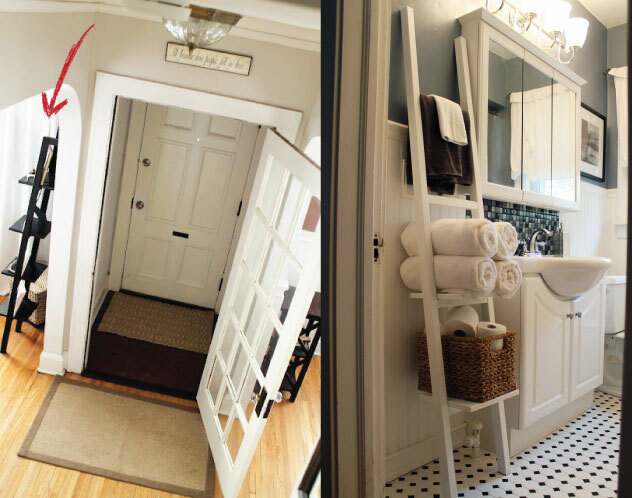 Luckily, you can turn a normal door into a dutch door for under $50 and a few hours of your time. For all the remodeling ideas out there, the laundry room is often neglected. If you keep your laundry machines anywhere visible at all, spend a few hours and $5 to make it look awesome. Using electrical tape, you can create stripes on your laundry machine to make it look great. The dots will take a little more patience, as you’ll have to find a tracer to outline so you can cut out the dots. If you have an empty corner on your outdoor deck, think about building a cozy reading nook. 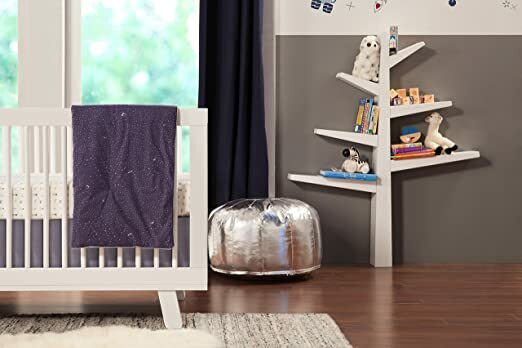 While it might seem difficult at first, you can build one for a very affordable $100-200, consisting mainly of a mattress frame and a mattress. If you want to save money, you can build your own mattress of foam, or you can try to find one that fits. If you have a closet under your stairs that is currently used for storage, you have an easy opportunity to create an amazing little nook. 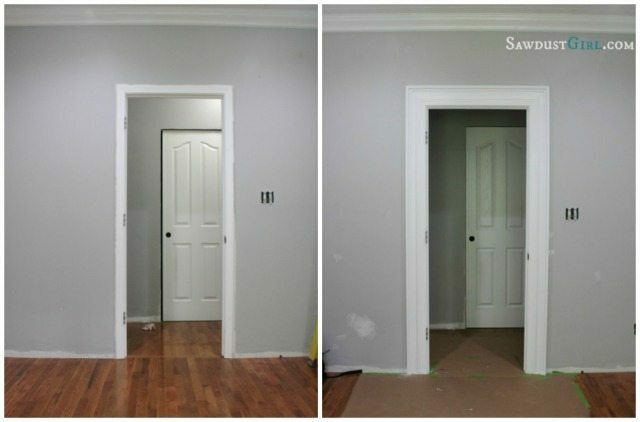 If you’re clever with how you paint the door, it can also appear like a secret room. It’s perfect for children, but most adults would love a little nook to hide away in once in a while, are you one of them?. Day beds are great to read on or do some work. 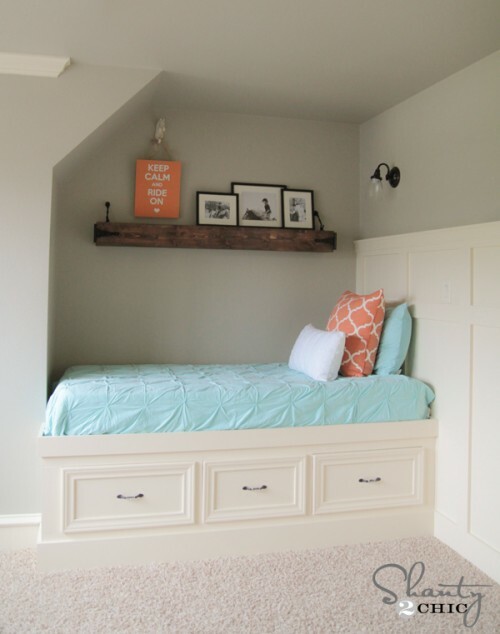 If you have a quiet area, like an attic, consider building your own daybed. It’s a big job, but the only real major costs are the wood and paint, which should add up to $150-250. The construction process is just like building a frame for a full bed, but smaller. A nice way to touch up your light switches are to add frames to them. You can find cheap frames at dollar stores or thrift stores, although you can always go to a craft store if you don’t mind spending a few dollars extra per frame. Once you procure the frame, paint them to match your light switches and then place them on top of the switches. 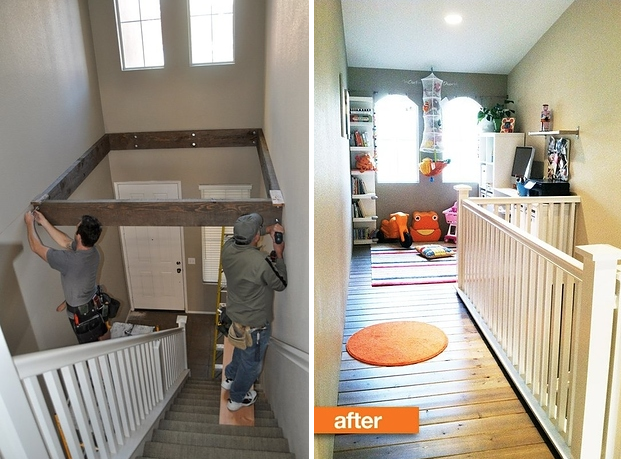 On top of the DIY projects that involve turning the space under your stairs into a useful area, you can also buy pre-made products if you have a larger budget. These storage compartments pull out from the wall and have a great outer appearance that makes them essentially hidden. They’re perfect for storing shoes and boots. The single (one triangle) compartment costs €325 euros, while the multi (3) compartment unit costs €525. This is an absolutely brilliant remodeling project that not only adds class and a touch of uniqueness to your home, but is extremely functional. The only major cost is the wood, which shouldn’t be more than $100 unless you go for expensive material. 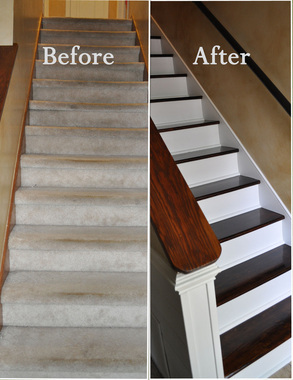 Remember to paint the wood to match your staircase before putting it together. This is, however, a project that you need to go slowly with at the beginning. Any cuts through the wall need to be done slowly and carefully. This brilliant transformation will leave you with a beautiful and convenient bench right by your door, and still allow you to easily hang your jackets. This won’t cost you more than $100-200 in materials, although you’ll need some standard power tools (mitre saw, nail gun, etc. ), but it will take at least a few weekends of time, so plan ahead. Light is one of the most important factors that affects the appearance of a room, as well as its functionality. Installing light fixtures that look better than your original ones is relatively inexpensive, but can make a huge difference. Grilles aren’t typically very pretty, but are just made of metal, which means they are easily replaceable. This project is fairly inexpensive, only requiring small sections of patterned sheet metal, along with a small amount of wood used for framing. After removing the original grille, you’ll need to attach the new metal piece over the hole and frame it with some painted pine (or other wood of your choice). These remodeling projects don’t necessarily have one intended home, but are great little projects to help take areas of your home to the next level. How convenient would a vacuum slot in the bottom of a wall be? You’ll need a Toe Kick Vac Pack, which costs about $20. Additionally, you’ll need a small shop vac ($30-50). The hardest part is finding a good location to install it. You will need to cut a hole in the wall and store the vacuum (which connects to the toe kick vac pack) on the other side of the wall (a closet works best). 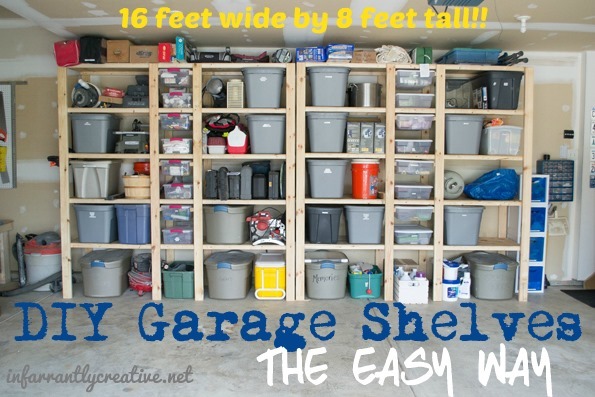 Garages typically have high ceilings that give them the potential of efficient storage. Unfortunately, most garages end up as giant piles of rarely used toys, equipment and miscellaneous junk. These shelves can be built in a weekend for between $100-200, depending on the size of the shelves you make. If your garage is big enough, you may not need to saw anything. Otherwise you’ll need a basic mitre saw and drill kit. 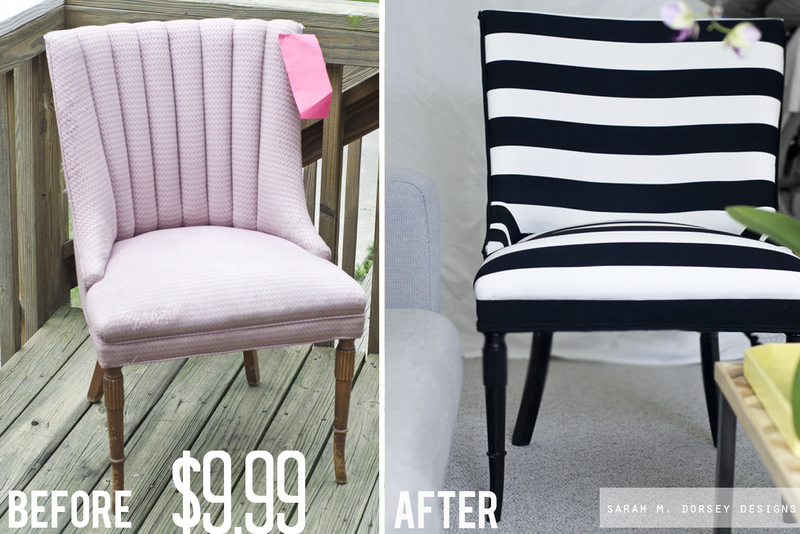 By keeping the frame intact, but ripping out the upholstery and painting over the legs, you have a $10-15 base chair that you can re-upholster with sleek fabric to make beautiful chairs for any room. This project requires no special tools, and shouldn’t cost more than $20-25 per chair. It’s up to you to decide how many chairs you need. Buying art for your home can get expensive real fast. For those with a creative inkling, you can easily make your own art, even if you’re not the best painter in the world (bonus points if you are). This art project involves simple taping, spray paint, and then you get to let your inner artist shine. It’s no secret that a nice rug can really improve the look and feel of a room, but why do all the nice ones cost hundreds or thousands of dollars? 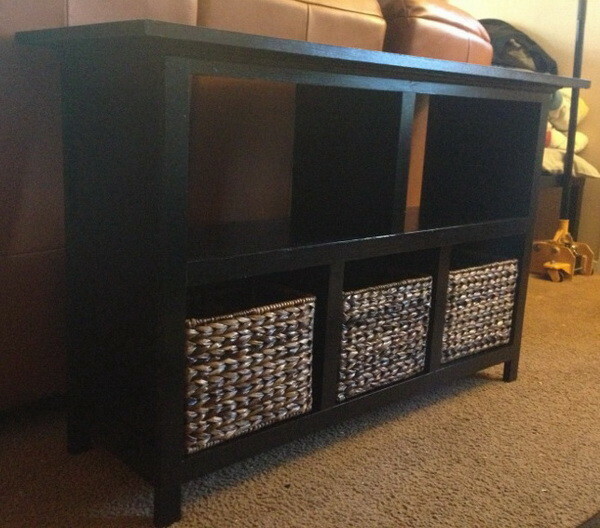 This DIY project can be done for right around $55, and can be done in a single afternoon. The exterior of your home is important when it comes to first impressions of your home. Plain foundation is almost always ugly, even if it’s painted. 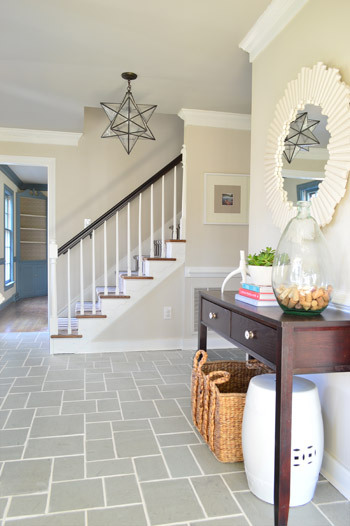 By adding a layer of tile or brick, you can significantly upgrade its look. 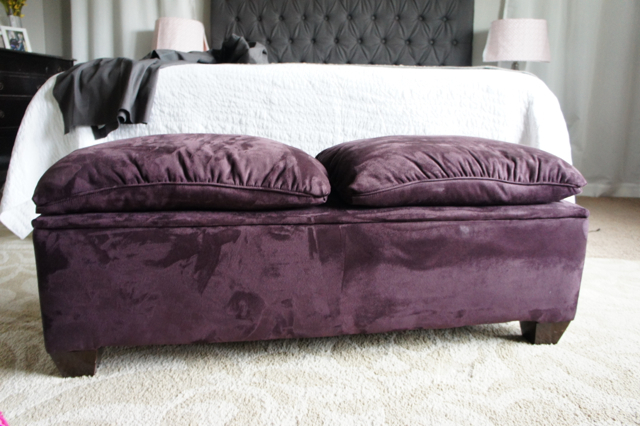 A high quality ottoman is a versatile and attractive piece of furniture. But even the cheapest ottomans go for $150-200, but if you want a really nice one that goes with your room, you’re looking at possibly hundreds more. This remodeling project consists of building a simple, but beautiful ottoman from scratch that will look great in any room. The total cost of materials is just over $100. You can also customize it so that it fits with your room design perfectly. 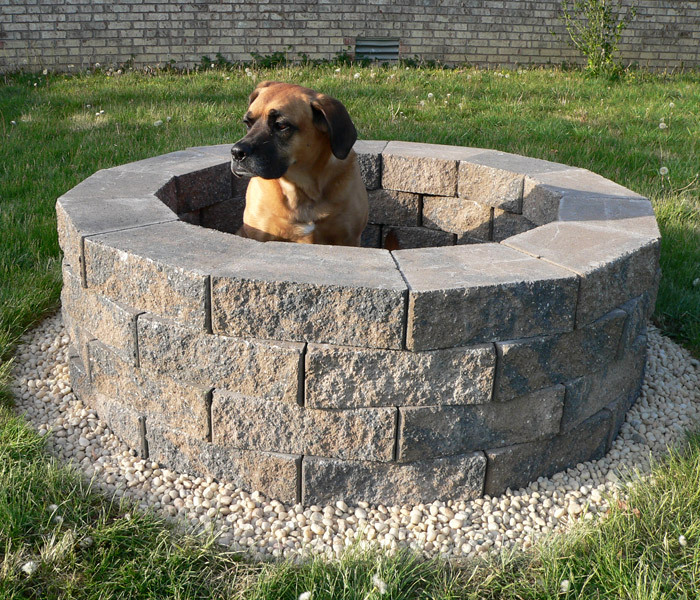 A fire pit is a great way to unwind on a summer evening, or a fun centerpiece when you entertain guests. This DIY project definitely falls under the manual labor category, but will only cost you about $100 in addition to your time. Building it is pretty simple and mistake-proof, you simply need to clear a small area on your lawn, fill it with a layer of pebbles, and stack bricks on top. As the name suggests, a sofa table looks great placed behind a sofa, but is versatile enough to be used elsewhere as well. It combines efficient storage with an elegant design. While it may cost you $300-400 to buy in stores, this project will only cost you around $85. Just remember to choose a paint color that goes well with your room’s color scheme. 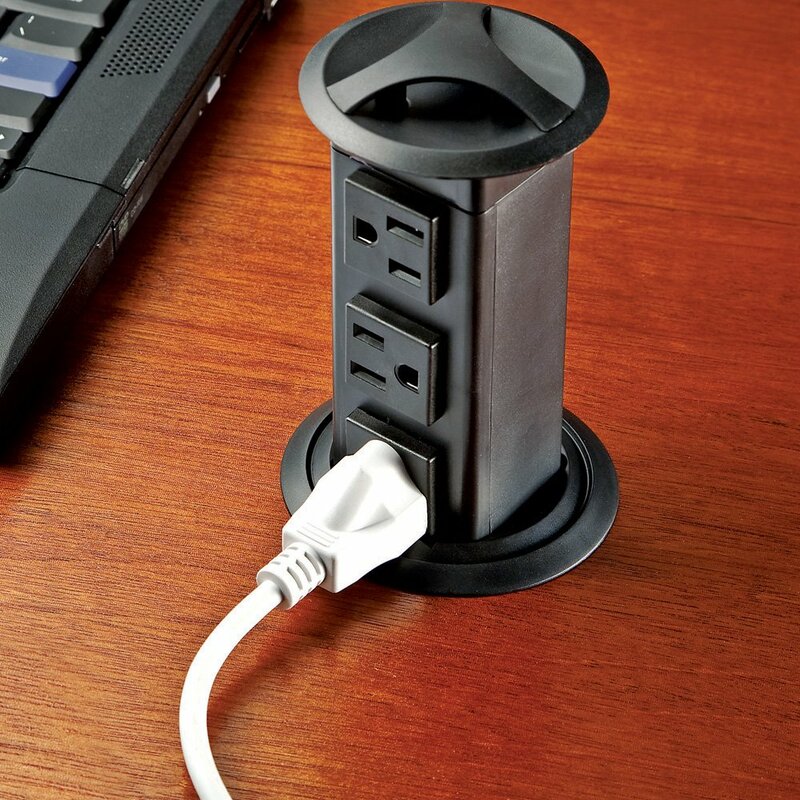 These outlets fit into most standard desk holes (intended for your mess of wires), and can be pushed down to hide them when not in use. Not only is this insanely cool, it’s very convenient compared to having to crawl under the desk. You can buy a ready-to-go outlet unit for just about $50 on Amazon. Depending on the layout and countertop material of your kitchen, you may be able to cut a hole that fits one of these power bars. This is an ingenious way to free up some extra space, perfect for a small nook or play area for children. This project will take at least a few weekends, and cost anywhere from $300-1000 depending on the layout of your home and the quality of materials you decide on. Still not bad compared to what a contractor would charge. If you have no experience building a floor safe enough for holding weight, it would be a really good idea to have a contractor come in and at least inspect your new surface. Possibly before you’re even done so you can make changes if needed. Sunburst mirrors are extremely trendy right now, but they often come with a hefty price tag that reaches over $300. You can make your own sunburst mirror with cheap materials that will cost you no more than $50, and still look like it was professionally made. Be warned, this project will require a lot of patience, but the end project is worth the effort. After 101 home remodeling ideas, there isn’t much more to say. Have fun improving your home, but be safe and plan well ahead to make sure everything goes smoothly.